When I first began reviewing garden books on this blog, many readers left comments about their own favorites and one recommended the books of Julie Moir Messervy. I finally got a chance to follow up on that recommendation recently when I borrowed one of Messervy’s books, The Inward Garden: Creating a Place of Beauty and Meaning (Little, Brown and Company, 1995) from the public library. When I ordered the book (the library had to get it from another branch), I was expecting a garden memoir or book of garden essays; so I was surprised when I picked it up to find myself holding a big picture book full of gorgeous color plates. In the acknowledgements, Messervy describes the book as a hybrid: “part personal memoir, part design manual, part philosophy text.” (p. 7) For me, it has been the most useful garden design book I’ve ever read; by the time I was halfway through it, I had gone online to search for a copy I could buy. Messervy, a professional garden designer, uses the metaphor of a journey to make principles of garden design accessible to the lay gardener. The book itself is presented as a journey where readers begin by remembering the loved landscapes of childhood, learn how to identify the types of landscapes that resonate for them, and then are guided through a process of applying these insights to their own garden designs. I was surprised to learn that I am strongly attracted to cave-like spaces with a sense of enclosure and to “harbors,” anchorages with a view out onto the world. Understanding this helps to make sense of why, when I was looking to buy a house, I fell in love with a heavily wooded property at the end of a dirt road with a strong sense of privacy and enclosure. It also helps to explain why my favorite place for looking at the garden is the “harbor” of the screenhouse on the back deck. I have always designed my garden one small area at a time, without any clear overall plan; so Messervy’s approach was particularly helpful in getting me to think about the big picture. I especially liked her chapter on gardens as “stroll journeys” and “mind journeys.” Stroll journeys are the ways that we physically move through our gardens. A stroll journey consists of a departure point, a destination point, paths that connect the two, and events along those paths. My garden has two kinds of departure points: entrances into the garden for those arriving from the driveway (the stairs up the back slope and the stairs into the back garden) and entrances into the garden for those going out from the house. The deck and the front entrance to the house are destination points for those arriving from the driveway but departure points for those going out from the house. 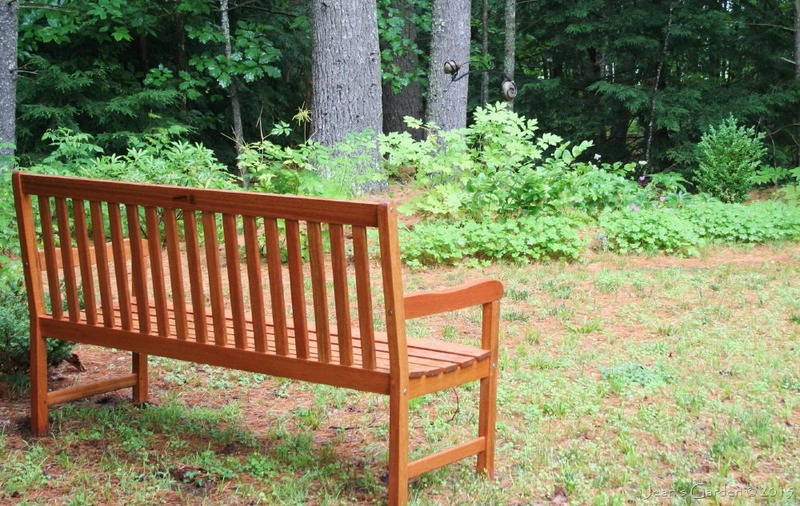 In the back garden, where a walkway connects the stairs up from the driveway with the deck, a side path leads to another destination point, the serenity garden with its garden bench. In the new front garden, the walkway from the top of the steps to the front entry will have a side path leading to a patio. Thinking about the garden this way made me realize that none of these paths will take a visitor into the lower part of the new front garden, confirming the vague sense I’ve had that this garden will need another departure point from the driveway, with a long curving path that leads through the lower garden and up the slope to the patio (the destination point for this stroll journey). It also helped me to realize that I want to have a path along the far side of the house (away from the driveway) that connects the front garden to the back garden. Mind journeys are the mental, aesthetic journeys we make through space from a stationary vantage point or viewing position. These viewing positions are often the destination points of stroll journeys (e.g., the garden bench in my serenity garden). In addition to the viewing position, which is the departure point for a mind journey, mind journeys also need frames for the pictures they make, and a focus (the mental destination point). Thinking about my garden this way helps me to think about the best arrangement for furniture on the new patio in the front garden. What will frame the view from this spot? What will the focus of that view be? Messervy points out that views from windows are also mind journeys, with the window providing the frame. I will need to think about how to design the new fragrant garden outside my large bedroom window so that it not only provides a pleasing event on the stroll journey through the front garden but a coherent mind journey for those looking out from within. Because both stroll journeys and mind journeys are ways of moving through the garden, Messervy follows her presentation of these two types of journeys with a discussion of movement in the garden, and particularly the importance of balance and scale in creating movement. In the past, I have thought about balance and scale in specific flower beds, but not in relation to the garden as a whole. I found Messervy’s instructions for thinking about balance in terms of triangles a revelation. When I did so, I could see that my house and the new retaining walls for the patio are two points on a big triangle that anchors my new front garden. But what is the third point on that triangle? Without one, the whole composition “leans” heavily toward the driveway. Balance will require a fairly large planting area on the opposite side of the front yard near the road; I think a planting of shrubs on the west corner of my property may be just what this composition needs. Reading The Inward Garden has been a powerful journey for me, one that has moved my understanding of garden design to a new level and also moved me forward in the process of designing my new front garden. This book is going to occupy an important place in my collection of garden books, and I think others may also find it a valuable resource. Thank you for sharing that lovely review! Makes me want to buy the book also! Melanie, I ordered my copy online last night and should have it in a few days. Jean, I am really glad to find someone else who responded to this book so positively. I first read this book shortly after it was published and found it inspirational. 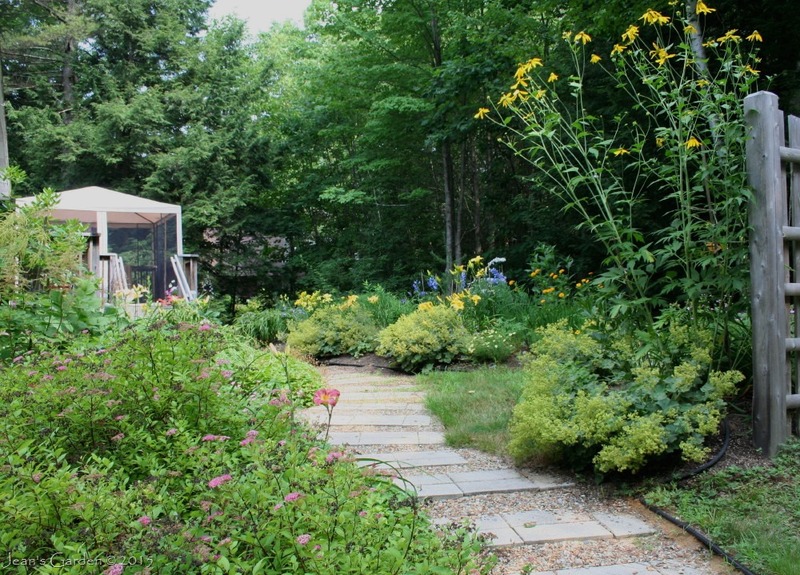 Without doubt, it has shaped my approach to landscape and garden design ever since. I recently re-read it and reviewed it in a blog post ( http://www.siteandinsight.com/the-inward-garden-a-retrospective-book-review/ ) and was as impressed on this reading as I had been before. It’s so interesting to read how you are using her insights in your own garden design. Pat, Thanks for reminding me about your review, which I obviously had read (because I left a comment on it), but which I wasn’t consciously remembering when I read the book. I think it must have been your review, though, that led me to look up Julie Moir Messervy’s name in the library catalog. It was interesting to re-read your review after reading the book and writing about it myself, because we tended to focus on different parts of her analysis (probably reflecting both differences in our interests and in our stages of development as gardeners). I’m honored to be in your company as a fan of this book. I have read many garden books but not found one that looks at the whole so well….I like the vision and thoughts of this author….I will have to find a copy Jean. Thanks for reviewing this book. Donna, I bought a paperback version of the 2nd edition (2007) available online at a discounted price. I think Messervy’s approach would really resonate for you. It sounds wonderful! I’m headed on-line now to hunt it down. Kris, I’m happy to set off a little run on the available copies of this book. It really is wonderful, and I think there is something in it for gardeners with different kinds of gardens and at different stages of development. This sounds wonderful, Jean. I’m especially taken by the stroll journey/mind journey. Since my garden is primarily a sitting garden I focus a lot on the “queen’s eye view” from the Adirondack chair, which I expect is also a harbor. Interesting. Stacy, The stroll journey/mind journey concepts were the part of the book most compelling to me, but it is also rich with many other ideas. If you look at Pat’s review of the book (see her link above), she focuses more on the seven landscape archetypes, of which the harbor is one. Hello Jean, from having read your review, I wonder if I will will be able to find this book in our local library. Thinking about triangles and composition, I’ll have o think quite hard about what the three anchor points in our back garden are. Definitely more research required. Sunil, I checked WorldCat, and there are about a dozen libraries in the UK that own this book. Do you have something like InterLibrary Loan so that if your local library doesn’t have it, they can get it for you from another library? Hi Jean, that’s a great idea, I’ll definitely check it out (didn’t know you could do that and it’s worth asking the question), thanks. I’m chewing over making the view framed by each window sing to me. Getting closer to being able to get out there and garden. Diana, I’m also getting closer to being able to get out there and garden — although for different reasons than yours. Yesterday, I went out in the sunshine and walked around outside, peering at some patches of bare ground where the snow has melted. I saw some green shoots of tradescantia beginning to come up, but no sign of spring bulbs yet. Jean, I’ve been somewhat unimpressed by many garden-related books of late. Thanks for bringing this one to attention. It sounds like one I will enjoy. Joene, You certainly have thought much more about the big picture of garden design than I have, but I think this book has something to offer gardeners and garden designers of all ability levels. When a book is good the result is that inspires beyond its subject or topic. I could relate to your review of Messervy’s book because I can use it in my new studio, though is not a garden I need it to be a place beauty and meaning. Thanks! Lula, How interesting to think about how these ideas might apply to interior design as well as garden design. Like you, I need my interior spaces to be aesthetically pleasing. I have this book. I brought it at some point when I went to hear Julie speak at MassHort. It is the mantra of my gardening ethos – I plant my garden for me. It is a personal journey, a personal labor of love. My garden has come to define a large part of me. Amy, I think it’s interesting that, while this book is not well known, so many people have cited at as a major influence on the way they think about their gardens. The Inward Garden seems to have had a big impact on those who have read it. Thanks for the recommendation – I was not familiar with the book or author. It does sound good. The name. The inward garden. Gosh. Just a perfect name isn’t it? Interesting,I have to read this book. A garden is a sanctuary for me,I like that the author used the metaphor of a journey to make principles of garden design.You might also like tips on how to create your own garden sanctuary at http://www.howdoesyourgardenmow.com/outdoor-privacy-ideas/. “A journey where readers begin by remembering the loved landscapes of childhood, learn how to identify the types of landscapes that resonate for them, and then are guided through a process of applying these insights to their own garden designs.” On point. i am a Chinese reader ,just read part of it and so pity I cannot find it online , as for buying it , it is too expensive for me to buy it by amazon and it almost can’t b be bought,could you tell me how to get the whole book online? My English is a little poor ,please help me.